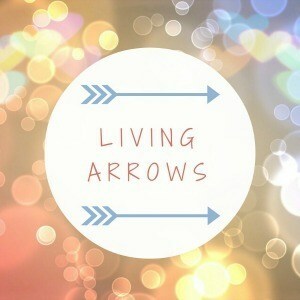 Hello and welcome back to another week of Living Arrows – I’ve managed a whole month! Yay! In case you missed my first post explaining what it’s all about, it’s a weekly project where bloggers post a photo or two showing a moment of childhood. I’ve used it as a way of getting used to taking my camera places I wouldn’t usually so I can capture our ordinary family moments, from our toddler deciding he wants to sleep in a teepee, to a morning at the park. This week’s photos are definitely very ordinary. They’re from a quick walk around the block on the scooter and SmarTrike to get out of the house between showers. But it’s a walk we should remember as it was little E’s first time on the trike. He’s nearly eight months old now, but to me he still feels too young to be in something other than the pram or baby carrier. I was surprised when Stew put him in it, but it was nice for him to be able to look around properly. He kicks his blanket off anyway, so it;s not like he would have been warmer in the pram. Another outing for the snowsuit! We were like a procession coming down the road with two of us walking, the trike and the scooter. As you can see from the photos we ended up walking down the lane so there was no risk of scooting onto the road, and half way around it was all change. S decided he was tired and wanted to go in the trike, so E had to be carried, along with the scooter. Next time we’ll stash the baby carrier somewhere to make it easier! Most of our weekends involve a little walk around the block, and it’s not exactly exciting. 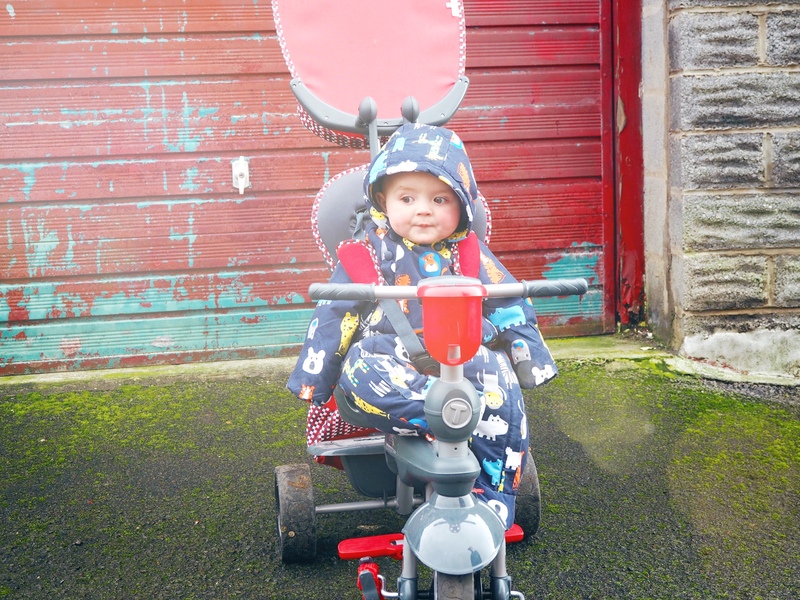 But when S first went on the SmarTrike it was a big thing as it was his first birthday present and we were looking forward to seeing what he made of it. 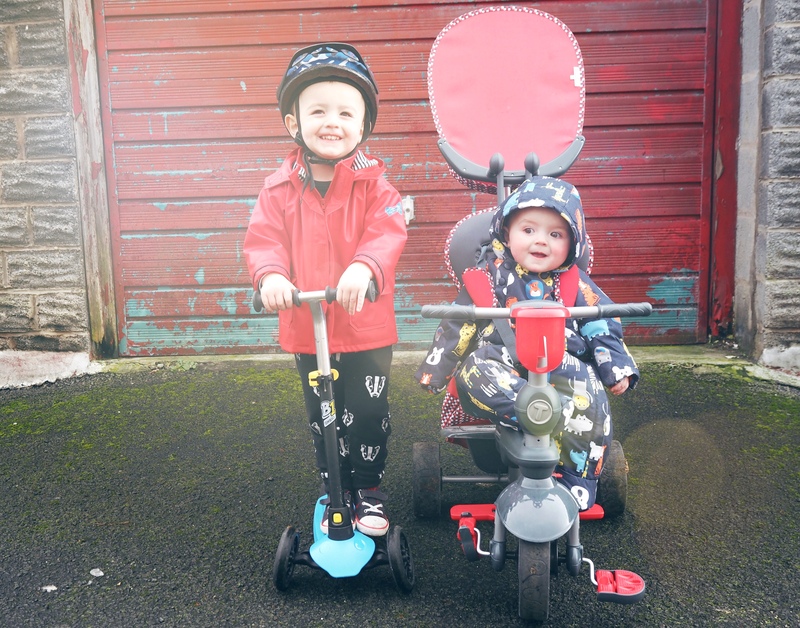 I sometimes feel that E won’t have the same little milestones as we’ve been there before, or it’s a hand-me-down rather than something new, so I just wanted to make sure we didn’t forget this little walk … even if he was ousted from his trike by his big brother! Just look at their cheeky faces, they both look like they are having lots of fun.